This entry was posted on Thursday, April 23rd, 2015 at 3:44 AM	and is filed under Ancient, Museums, Treasures. You can follow any responses to this entry through the RSS 2.0 feed. You can skip to the end and leave a response. Pinging is currently not allowed. I don’t know what the early Germanic perception of the owl was, but by Tthe medieval period and Renaissance, the owl had acquired a bad reputation in Northern Europe. It was associated with darkness, treachery, trickery and deception. Since birds attack owls in daylight, bird catchers would take an owl and firmly attach it to a mobile blind, and the birds would come to them. Hence the bird’s evil reputation. Engravings of the Renaissance sometimes use the owl as symbol of trickery and deception. Fascinating. I didn’t know the owl developed so negative an association up north. 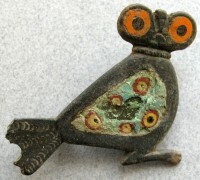 I can’t help but wonder if that’s a factor in this being the only owl fibula found in Scandinavia. Thank you! Hope they make copies to sell at the museum’s gift shop! Hell yes. If ever there was an artifact tailor-made for gift shop reproduction, this bright-eyed fellow is it. Me, too! I am entranced. My grandmother collected owl things, and so do I. One of my granddaughters does too– and without knowing that either me or my grandmother did. This one is absolutely entrancing. Native American cultures vary in perception of owl; many people have heard of the story from some cultues about owl calling one’s name in anticipation of death. But this wasn’t not a foreboding thing. Death is part of life. And sometimes the call is a warning. I don’t have a collection, but I have loved owliana since we went to Greece when I was a little kid. So many Athenian owls everywhere! I like that the harbinger of death is not necessarily a figure of evil, but rather an important player in the cycle of life. By sheer coincidence, I was just reading about the island Bornholm this morning (in Norman Davies’s “Vanished Kingdoms”). It might relevant to know that, although it is Danish now, the Bornholm is in the middle of the East Sea and has, over time belonged to (parts of) Sweden, Germany and Russia and the local population still speaks a language which is clearly related to but different from other Scandinavian languages. The island was discussed in the book as an earlier home of the tribe of the Burgundians who invaded the Roman empire (well, the Germania region) early in the 5th century. (nothing is certain about where they came from but the old Norse name of the island was ” Burgundarholm”). That would fit in nicely with the background story of this owl: ‘barbarians’ from beyond the borders of the empire who come in small numbers and serve in the Roman legions and return en masse a generation or so later. Is there any word on that hole in the tail? It looks about the right size for another inlay that has broken/oxidized out, or for a connecting chain anchor point. It’s not the right orientation to set the pin on a Roman brooch, nor is there a round hole in the tails of its contemporary owl brooches, to my knowledge. …and the hole is almost perfectly round, which screams “deliberate” since this item was not found in a stream bed where a tiny pebble could make a cauldron in it. Any word on this being a talisman that can ward off the Owl Trembler? You know there is no such talisman. It’s not physically possible. Where does the pin run from and to and do you have a picture of the back? A small shop with copies of many things in the town of Svaneke in Bornholm, called “Vikingehuset” Link here: http://bornholm.info/da/vikingehuset-svaneke has a beautiful copy of it made in silver (instead of bronze) with enamel. Hope it helps you.